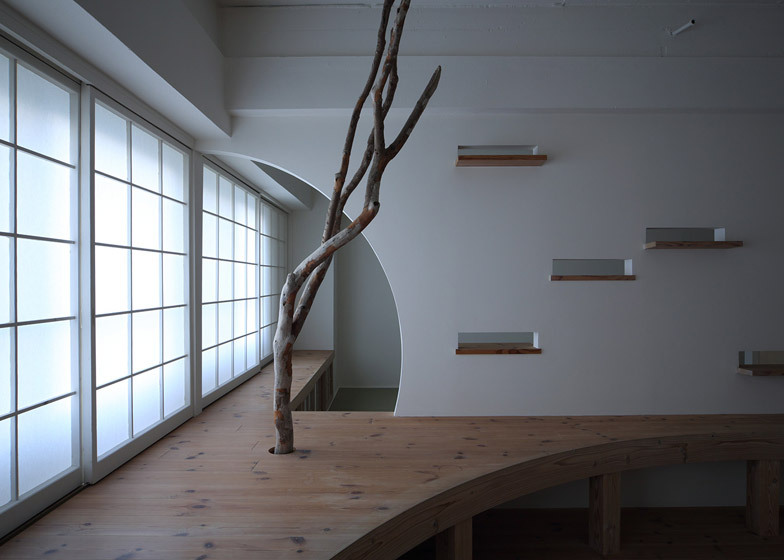 Japanese studio Nano Architects has renovated a small 1960s apartment with custom-built wooden furniture, ornamental driftwood and unusually shaped openings – a process described by the team as "cyborg surgery" (+ slideshow). The project, named The Times Resuscitation Building, involved refurbishing the interior of an apartment in the 1967 red-brick building known as Sanno Mansion in Fukuoka, Japan – a building where the architects had previously designed another home. Nano Architects transplanted a modern interior into the flat in the dilapidated building, adding surfaces with curved edges, adjustable wooden shelving and clean white paintwork. "It was a cutting-edge rental apartment with a telephone switchboard room and an elevator that was rare at that time," said the architects. "It fell into a negative spiral of decreased occupancy rate, reduction of rent and declined revenue. Everyone had been feeling that it had no value with its aged modern style appearance." The architects said they wanted to "resuscitate the life" into the apartment by pairing new fittings with the original features. "It is like a cyborg surgery that resuscitates a life that is drifting at the brink of death by replacing the dysfunctional areas," said the architects. 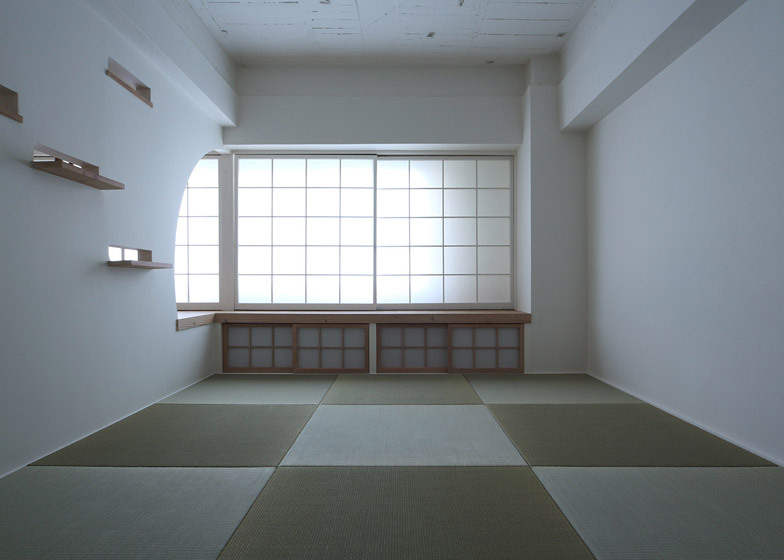 "Dingy" tatami-mat flooring was replaced with chequered green-grey matting, alongside pale wooden floorboards. 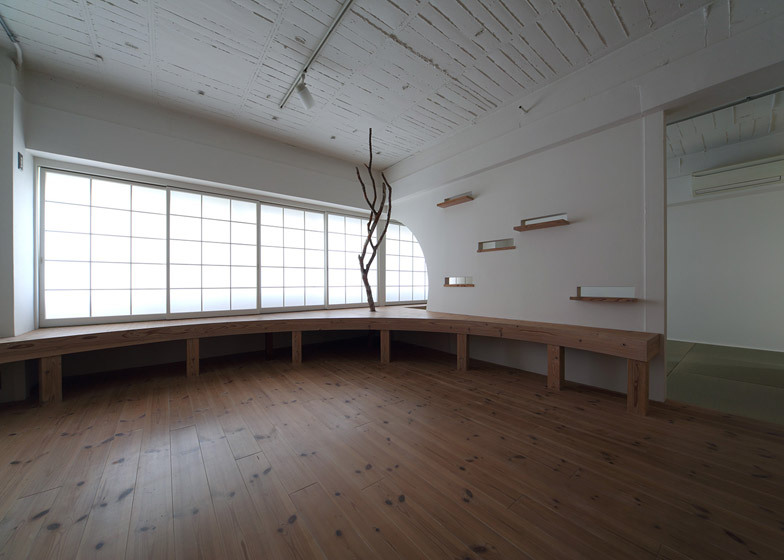 In the living room, a curved table constructed in the same timber as the floorboards was built under a large horizontal window that runs across the front of the flat. 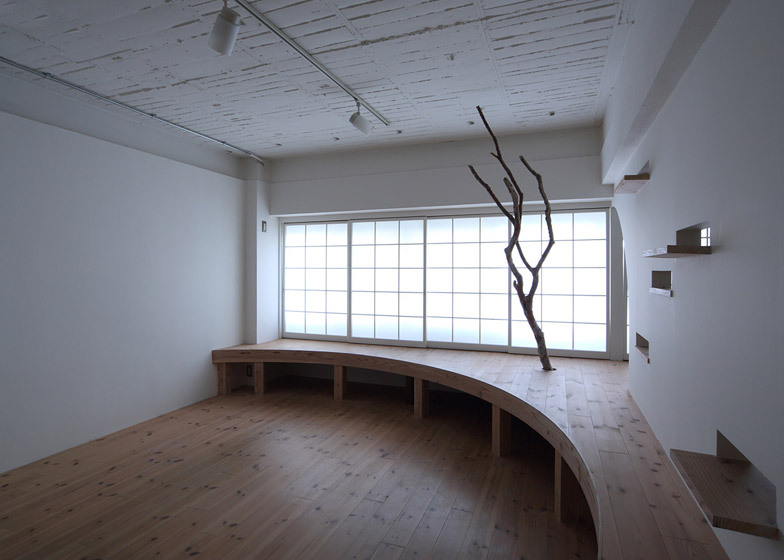 According to the architects, a sculptural piece of driftwood inserted into an opening in the tabletop symbolises the significance of undervalued objects and materials. "Like the driftwood – which has no value – is transformed into a valuable object, Sanno Mansion could also be revived through the renovation," they said. 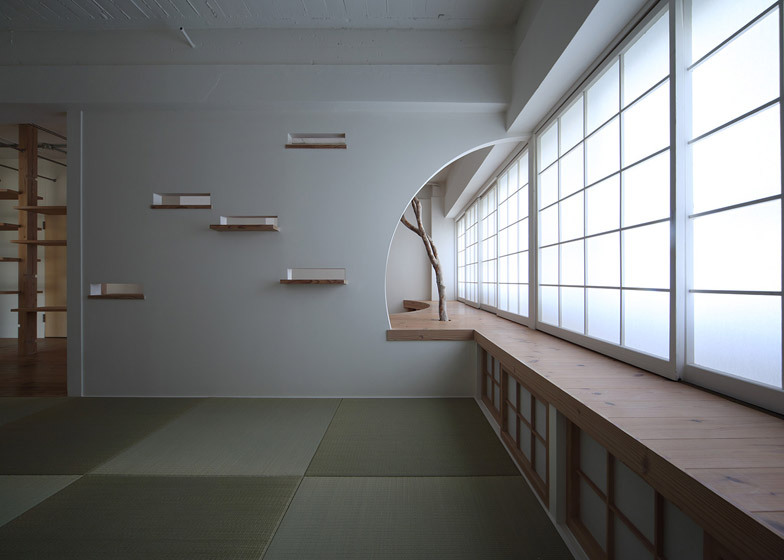 In the white wall between the living room and bedroom, a large curved cut-out lets light pass between the two spaces, and a series of small wooden shelves protrude from letterbox-like openings. The wooden table-top continues through the curved gap into the bedroom to create a wooden window seat. Beneath the bench, a storage space has sliding doors framed to match the proportions of the frosted window panes. By the entrance to the apartment, located at one end of the living room, a large wooden shelving system partially separates an entrance hall from the kitchen. The unit has moveable shelves that slot into grooves in the up-posts. Slim metal rails stretch between the living room and bathroom walls, skewering the top of the shelving unit to create a built-in washing line for the residents. Photography is by Yasunori Hidaka.